The national media frenzy about the U.S. unemployment rate shooting up to 7.6% doesn’t even do justice to the actual unemployment figure, which in reality stands at around 15 per cent, just 9 per cent shy of the unemployment total at the very height of the great depression. Newsweek’s Dan Gross explains the myth behind the unemployment figures in the video below. (VIDEO) Hillary Sworn in as Sec of State. Secretary of State Hillary Clinton takes the oath of office at a ceremonial swearing-in ceremony at the State Department. Chief Justice Roberts interrupted Obama early and then switched the order of some of the words, slipping up the new president and causing him to hesitate at one point. ROBERTS: Are you prepared to take the oath, Senator? ROBERTS: …preserve, protect and defend the Constitution of the United States. OBAMA: …preserve, protect and defend the Constitution of the United States. Jill Biden told Oprah Winfrey that her husband was offered his choice of positions in Barack Obamas administration. This video is from ABCs The Oprah Winfrey Show, broadcast Jan. 19, 2009. This is your backstage pass to your government – so connect with your elected leaders on YouTube today. President-elect Barack Obama introduced his National Security team on Monday. 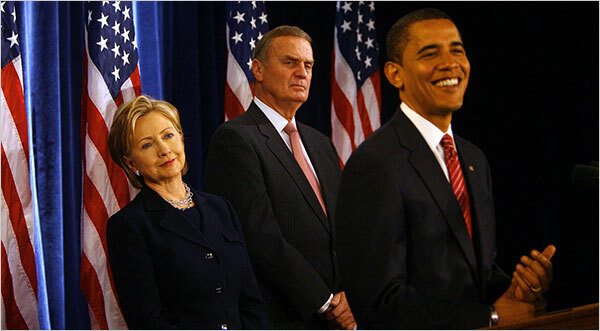 President-elect Barack Obama unveiled his national security team today, including formally announcing his intention to nominate his onetime rival for the Democratic nomination, Sen. Hillary Clinton of New York, as the next secretary of State. Obama also announced his intention to keep current Defense Secretary Robert Gates in his post, likely for at least a year in the new administration. The president-elect also said he would nominate Susan Rice as ambassador to the United Nations, retired Marine Gen. James Jones as his national security adviser, Arizona Gov. Janet Napolitano as homeland security director and Eric Holder as attorney general. Bob Schieffer spoke with Barack Obama’s Chief of Staff Rahm Emanuel about any immediate action the president-elect may take in an attempt to prevent a recession.